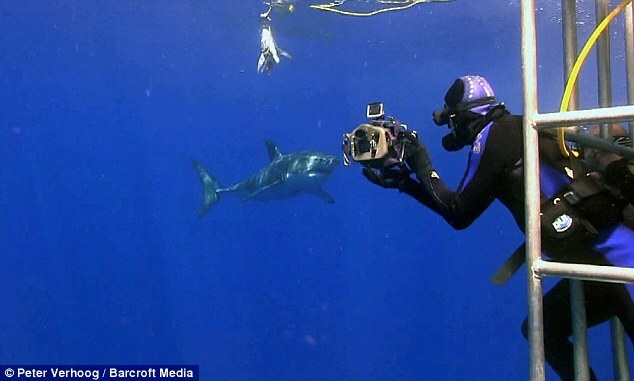 Shark Diver : Shark Diving : Swimming With Sharks: "Selfie" shows what sharks are like? "Selfie" shows what sharks are like? When it comes to sharks, the news coverage is pretty atrocious. It seems like they either portray the sharks as mindless killers, or harmless pets. The people that get coverage, are invariably doing something stupid, or flat illegal. An example of the stupid kind is the latest report by the "Mail Online". They are posting an article that features a diver taking "selfies" while leaning way out of a cage, while diving with great white sharks at Isla Guadalupe. This picture reminds me of a professional photographer that was leaning out of a cage, filming a shark and never realized that a second shark was coming at him, with his mouth open. If it wasn't for another diver smashing his camera against the sharks nose, it would have taken the photographers head off. After the dive, the photographer didn't believe that there was a shark behind him and to this day, doesn't believe that he was within inches of being bit. It is not the shark that you see that will get you, it's the one you never know is there. For the diver in this picture to make a statement like: 'I began making selfies with all kinds of sharks – mostly for fun. 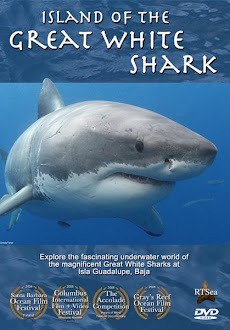 'Only later I realized that they could show people what sharks are like – when behaving normally, there is no danger. Yep, you want to show people what sharks are like by taking a "selfie". You could not possibly achieve this by filming the sharks and show, how they behave. Nope, you have to get yourself into that picture to accomplish that. Trying to get your 15 minutes of fame had absolutely nothing to do with it. Newsflash, while it is true that we are not on their menu, great white sharks are NOT harmless, specially when you are in a baited situation. I don't understand why people who say they love sharks, feel the need to portray them as something they are not. Are those people somehow ashamed that great white sharks are apex predators and not harmless pets. 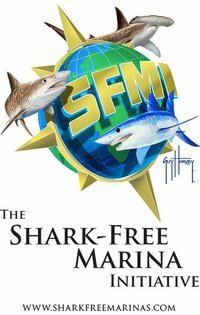 If you want to come face to face with a great white shark and believe in doing is "safe and sane", give us a call at 619.887.4275 or email staff@sharkdiver.com. We are looking forward to showing you these awesome sharks from inside a cage. which goes too far the other way!